We’ve had several organizations ask us over the last few months about the returns for financing residential solar. Before we get there, however, let’s make sure we understand what’s included in the returns. Essentially, there are only two places to earn returns in residential solar: from installation or financing. Installation (or “dealer”) businesses earn profits much like any contractor does, by finding customers and getting them to pay for an installation of equipment. Financing businesses earn money by investing money in solar systems up front and collecting fees over a long period of time. 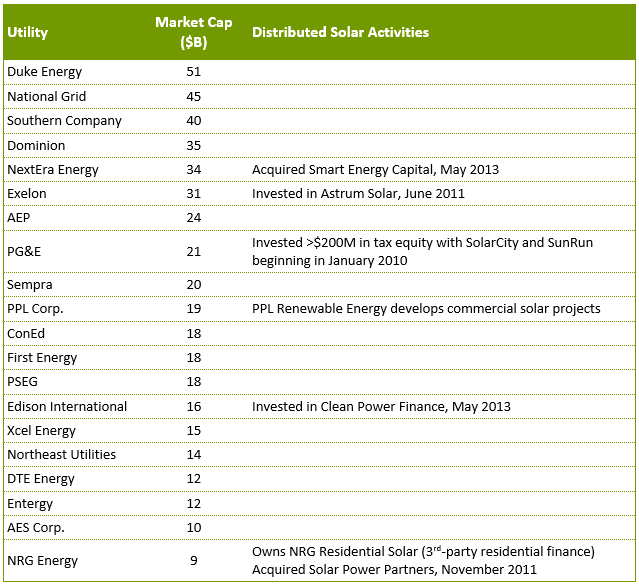 Some companies, like SolarCity and Vivint, are vertically integrated in these business. Others, such as Sungevity, acquire customers and provide financing but rely on others to do installations. However, these variations don’t create new profit pools, they are just different ways of splitting up the profit pie. NextEra Energy acquired Smart Energy Capital, a commercial solar developer. Edison International and two other large utilities invested equity in Clean Power Finance, the residential solar finance clearinghouse. The Wall Street Journal reported American Electric Power, Southern Company, and Dominion Resources are also considering possible entry into the market. These aren’t the only such companies looking into the business. Two of the most compelling stories in energy over the past few years have been the rapid growth of competitive electricity supply (“CES”) and rooftop solar. Although the two industries directly compete in some states, we have worked with executives in each industry who know relatively little about the other. However, we believe CES and solar businesses could help one another reduce customer acquisition costs and solar companies could help CES businesses stabilize cash flows over a longer period and increase customer lifetime value. Both industries have enjoyed rapid growth in recent years. Eleven million consumers in 13 states plus the District of Columbia buy power generation services from competitive suppliers. (For the most part these consumers continue to buy electricity delivery services from a local monopoly utility.) The number of residential CES customers has grown at 16% annually since 2008 and more than half the consumers in some markets buy from a competitive supplier. Meanwhile, the amount of residential solar capacity installed each year has grown at an annual rate of 56%. One of the key drivers of this growth has been the emergence of third-party-owner financing models, in which consumers spend little or no money up front but agree to host systems at their homes and buy the power produced for 15 to 20 years. Another has been a precipitous fall in the cost of solar equipment. Residential solar dealer profit margins look at lot like those for conventional electrical, plumbing, and HVAC contractors. What should dealers do? Over the past year, Woodlawn Associates has worked with nearly 20 residential solar dealer-installers on projects to optimize the costs of customer acquisition and installation. These projects were quite tactical, but it is worth considering some of the more strategic findings and their implications. You can view an extract here.